First off, Maxie is just fine. 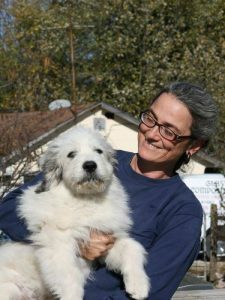 For some reason when I mention we have a new livestock guardian dog (LGD), people get a panicked look on their face and as they hesitate to ask, I reassure them, Maxie is alive and well. However, Maxie is about to turn 5 years old. She has been out of her puppy phase for a year and has another 3-4 good years of guarding in her. By the time Zeke is out of his puppy phase, Maxie will be just about ready to start slowing down and ease into retirement. We were lucky enough to find Zeke at just the right time, from just the right person. 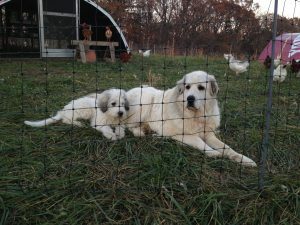 Our friend Kim had adopted a Great Pyrenees, Lucy, that was pregnant. Kim has a farm about an hour or so away and after getting to know her over the past few years, I trusted how she would raise the pups and the care they would receive while waiting to be adopted. I did hem and haw about whether we should get a pup. The father was potentially a Great Pyr/Komondor mix or an Australian Shepherd. 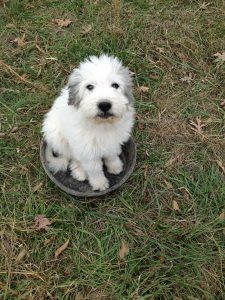 There is a difference between a LGD and a herding dog; mainly LGDs don’t herd. With us having 400 chickens at a time, a herder is NOT what we wanted. 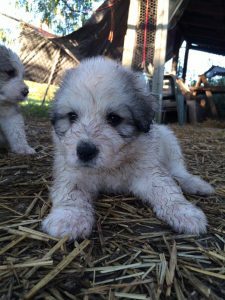 Once the pups started to show a bit more of who the father may be, more than likely the Pyr/Kom cross, we decided to get Zeke. Car sick and homesick is no fun! 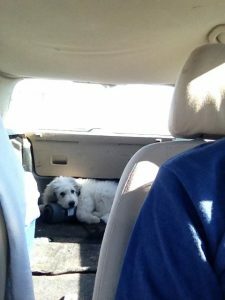 Once we were all in, we waited for the 12 week mark to come so we could go pick him up. I went to pick him up and had a less than rousing meeting with him–a quick sniff and he went to take a nap. His siblings were more eager to mingle. After getting all the details and petting on Zeke for a bit, I packed him, a toy, and his blanket in the back of the car and headed home. He cried for the first 20 minutes, threw up 3 times, and peed once. When he snuggled up to his blanket that had his mom’s scent on it, it was hard to not feel like I just ripped him from his family. Once we arrived home, Bonnie our other dog, was at the ready with some good “nice to meet you” sniffing. As soon as I opened the back door, Maxie went crazy. I guess she could smell him and all that training to not let other dogs come around had paid off. I walked him over to Maxie at the fence and let them smell each other for a bit, then we went in. A few pets to Maxie and away she went, leaving poor Zeke to wonder what he should do next. I stayed with him for a bit, walking around the area trying to get Maxie to engage with him, and watching him with the chickens. 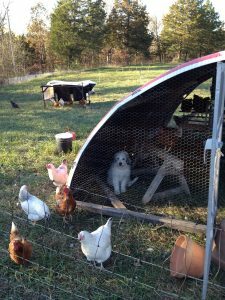 We keep the chickens and Maxie in an electrified netting area to keep everyone safe and out the road and the woods. Usually we don’t electrify it because everyone has been trained on it and respects it. Zeke had to be trained on it. After 2-3 shocks, he learned not to touch it. And so far has respected it. 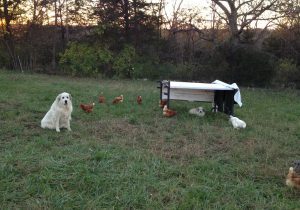 Livestock guardians are meant for protecting sheep, goats, alpaca, even cattle, not chickens. Chickens trigger too much of a prey drive and they will chase a bird. No matter the parents history, lineage, or exposure to birds, it takes training to make sure they are safe to be left unsupervised. And I ignored every bit of that with Zeke. After ramping up chicken, hog, and cattle production this year, I just didn’t have it in me to do all that I should have when it came to supervising him. Thankfully, he has been great with them. He was raised with them and that really does help. I am also hoping it’s partly due to being with Maxie. She is, after all, supposed to be mentoring him. After a few days, Maxie finally started to come around. I would catch her letting Zeke sit or lay next to her instead of moving away. Then I caught them full on paying with each other–rolling, biting, jumping around–and I was relieved. She was accepting him. Now I find them sleeping together behind the coop or playing with a milk jug. To keep food aggression from happening, I feed them close to each other and randomly take one dog’s food and make sure the other respects the one eating. I also take food from them both, pretend to eat it, and toss it back to them. Since there is a new dog in the pack, this establishes me as the alpha dog; I take food when I want and give you what I want. Maxie and Zeke will work out which of them is top dog when we aren’t around, but when the pack is together, they listen to us. Zeke has learned that if he wants to eat, he has to sit and wait until given the ok. He’s loving his raw food diet. Now when I take out meat for our dinner, a portion will go to Zeke to add to his carcass dinner. When people find out we don’t give the dogs treats I get lots of “awww that’s so mean!” Then I tell them what our dog’s meal may consist of–flank steak, salmon, pork shoulder, eggs–and all of a sudden I’m not so mean. Day 1 She wasn’t mean to him, just didn’t want to be near him. Day 4 Maxie on the look-out and letting Zeke tag along. 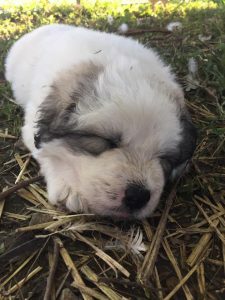 So far–knock on wood–he is looking to be a great companion to Maxie and the chickens. We have not seen any guarding behavior yet. I make sure to play up the praise when Maxie is going after something and Zeke does run over with her to see what’s going on, but no barking yet. 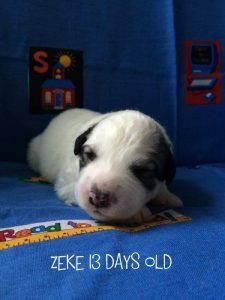 So after 3 years of puppyhood with Maxie, we start all over with Zeke. I am hoping it’s like what parents say about kids–the second one is always easier. Wow, This is awesome. Thanks for sharing. I look forward to reading more of your posts. I so love the update. 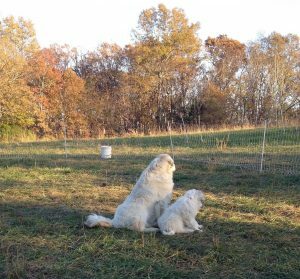 I know With his upbringing, your guidance, and Maxie’s mentoring…Zeke will grow into a fine livestock guardian. I will also be happy to come over and eat dinner with him anytime. Thanks for the initial Maxie and Zeke story; I am looking forward to many more! He’s so cute!!! At the holiday parade today there was a group with a bunch of Great Pyrenees– the kids all yelled “look at all the Maxie dogs!! !” Except they were wearing Christmas sweaters and clearly guarding nothing!